The Cold War was the tense relationship between the United States and the Soviet Union (USSR) during the 46-year period following the World War II's end, but before the end of the Soviet Union. It refers to the time between 1945 and 1991. The war was unlike any other war, because the two countries' armies never directly went to war with each other. Many people feared that the relations would end in a nuclear war, but that never happened. Both the United States and Soviet Union had multiple countries on their sides. These countries were known as satellite states or client states. The United Kingdom, France, New Zealand, Australia, West Germany, Canada, and the Netherlands are examples of countries on the American side. 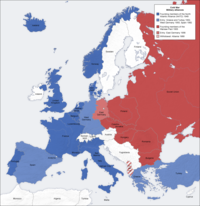 East Germany, Czechoslovakia, Romania, Hungary, Poland were on the Soviet side. Cuba, North Korea, China, Mongolia and numerous other countries were friendly to the Soviets at various times. The outbreak of the Cold War was due to the different ways of thinking - known as "ideology" - both in economy and government. The United States used capitalism as their economic and governmental system while the Soviet Union created its own version of socialism. Both countries claimed to be a "democracy", but neither one believed each other. These differences led to a tense relationship between the two countries. The USSR and the United States were friends during World War II because both countries did not approve of Nazi Germany's ideology, even though the United States' private investors originally gave money to Nazi Germany before the war started. While they were friends, both the USSR and the United States still did not agree with each other in terms of government, but both thought that it was more important to work together fighting against Germany. After WWII left Germany in tatters, the Allies split it into four parts. One part was given to the United Kingdom, one part to France, one part to the USSR, and one part to the United States. The Eastern German city Berlin also separated, even though Berlin is located in the Eastern part of Germany, which was the Soviet compartment. The three Western countries compiled their sections of the country together to form a country known as the Federal Republic of Germany (Bundesrepublik Deutschland or BRD). The USSR then named their section of Germany the German Democratic Republic (Deutsche Demokratische Republik or DDR). The Western parts of Berlin were, like the country, placed together to form West Berlin: a BRD enclave inside of the DDR. A proxy war is when two powerful countries fight indirectly. There were some proxy wars during the Cold War. For example, when a third world country was in a civil war, the United States might support the army which was anti-communist and the Soviet Union would support the army which was pro-communist. For example, author Michael Lind wrote that the Vietnam War was a proxy war between the United States, the Soviet Union, and China, which had become a Communist country. The Soviet Union and China worked together to help North Vietnam, while not directly fighting in the war. The United States directly fought in the war against North Vietnam. With both North Korea and South Korea sponsored by external powers, the Korean War was also a proxy war. In 1953, Soviet dictator Joseph Stalin died and Nikita Khrushchev took his place. A period of De-Stalinization began and Khrushchev was trying to reverse many of the things Stalin did (such as prison camps and cult of personality). During the 1950s, there was a "red scare" in the United States. During the Cold War many Americans were worried about Communists becoming powerful in the United States. Many Americans were accused of being Communists, especially actors, artists, and political figures. Accusing someone of being a communist was very serious because the United States government told the people that the Communists were the enemy. This was often done as a political attack. Many actors were 'Blackballed' and were not allowed to act in any movies after they were accused of being Communists. The McCarthy Era was a period when many important or powerful Americans were accused of being communists. Most of them were political opponents of McCarthy, who had a powerful position in the government. Many science fiction Hollywood movies were made in the 1950s (such as Invasion of the Body Snatchers, War of the Worlds and the Day the Earth Stood Still) and a lot of these movies reflected the Red Scare that took place at the time. Typically, aliens from another planet began taking over small towns and the people in them, and turning them into aliens too. The aliens and creatures in these movies reflected communists, and the fear of them taking over. The 1950s were the beginning of a space race between the US and USSR. It began with the USSR putting the Sputnik satellite in space, making the Soviet Union the first country to go into space. They soon sent the first man into space to orbit the Earth, named Yurii Gagarin. The Soviet Union claimed that this proved that socialism was the only way to go into space. The United States responded by starting NASA, and soon sent up its own satellites. In the 1950s, the United States (under president Dwight Eisenhower) created a policy called New Look which meant to reduce military defense spending while rapidly increasing the amount of nuclear weapons it had. It was a policy of nuclear deterrence (which means that the United States built so many nuclear weapons, it intimidated the Soviet Union from attacking them). United States Vice-President Richard Nixon engaged in several talks with Nikita Khrushchev during the 1950's. One of these was called the "Kitchen Debate" because it happened in a kitchen at the World's Fair. These debates highlighted the political and economic differences between the U.S. and the USSR. At the end of the decade, a United States plane which spied on the Soviet Union, called U2, crashed. This was very bad for U.S.-Soviet relations, and the tensions between the two countries increased. Template:Main article After the United States tried to invade Cuba and failed, the Soviet Union supplied Cuba with nuclear missiles. The missiles in Cuba allowed the Soviet Union to effectively target almost the entire United States. The United States sent a large amount of ships around Cuba to stop the Soviet Union from delivering them nuclear weapons. The United States and Soviet Union came to agreement that the Soviet Union will no longer give nuclear weapons to Cuba as long as the United States does not invade Cuba again. This was the highest period of tension during the Cold War and it was the closest the world was to having a nuclear war, something that would have caused a chain reaction that could have spread around the whole world. This time period began after the Cuban Missile Crisis in 1962, and ended around 1980. The word "detente" (pronounced day-tont) means less tension between two countries. In this case, it meant an improved relationship between the United States and the Soviet Union. During this time period, as China began to dislike the Soviet Union, the United States built a good relationship with China, giving the Soviet Union a disadvantage during the Cold War. During the 1970s, the United States and the Soviet Union both signed several treaties which reduced the amount of nuclear weapons each country had. The policy of détente ended in 1981, when president Ronald Reagan ordered a massive military build-up to challenge the Soviet Union's influence around the world. The United States began to support (by giving money and weapons to them) anti-communists all over the world who wanted to overthrow their communist governments. The Soviet Union had a slow economy during this decade because military spending was at an all-time high. They tried to keep up with the United States in military spending, but could not. The Soviet Union invaded Afghanistan in 1979, and the Soviet Union was having a very difficult time winning against the Taliban, a group trained by the United States to fight against the Soviet Union. The Soviet Union's failed invasion of Afghanistan is often compared to the United States' failure during the Vietnam War. In the late 1980s the new Soviet President Mikhail Gorbachev made an effort to make an ally of the United States to fix the world problems caused by the war, with the ultimate aim of eliminating nuclear weapons completely. However, this did not take place because the President of the United States, Ronald Reagan, insisted on having a nuclear missile defence system. The people of the Soviet Union were divided on their feelings about this. Some people wanted President Gorbachev to fight harder to nuclear weapons, while others did not want him to be talking to the United States at all. These mixed feelings created an atmosphere of political fighting, and the people were no longer united behind one goal. Because of this, leaders of the Soviet Union started to fight against each other, the Communist Party began to crumble and the Soviet Union collapsed. After the fall of the Berlin Wall in 1989 and without Communist rule holding the countries that compiled the Soviet Union together, the USSR broke into many smaller countries, like Russia, Ukraine, Lithuania and Georgia. The nations of Eastern Europe returned to capitalism, and the period of the Cold War was over. The Soviet Union ended in December 1991. Not all historians agree on when the Cold War ended. Some think it ended when the Berlin Wall fell. Others think it ended when the Soviet Union collapsed in 1991. This page was last edited on 14 September 2018, at 18:43.